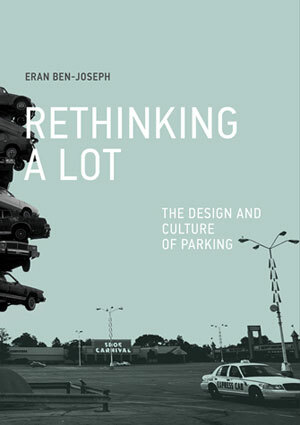 In a fascinating new book, Rethinking a Lot, M.I.T landscape architecture and planning professor Eran Ben-Joseph tells us there are now 600 million cars worldwide, and more than 500 million surface parking lots in the U.S. alone. In some cities, parking lots take up one-third of all land area, “becoming the single most salient landscape feature of our built environment.” Given cars are immobile 95 percent of the time, Ben-Joseph argues that it doesn’t matter whether you have a Prius or a Hummer, you have the same environmental impact, taking up the same 9-by-18 foot paved rectangle. All of those paved spaces “increase runoff and affect watersheds,” create heat islands, increase glare and light pollution, and impact the “character” of our cities. But, to this day, Ben-Joseph writes, “parking lots are considered a necessary evil; unsightly, but essential to the market success of most developments.” Unfortunately, the story goes that the parking lot hasn’t really changed much since the 1950s. So, the time is definitely ripe to redesign the lot and turn it into multi-use infrastructure that offers communities both environmental and social benefits. Ben-Joseph’s book is so clearly written and designed and includes such great photos you find yourself interested in what could be a really dull subject. In a bit more than 130 pages, he explores the “planning and design approaches to the parking lot” along with commentary on “cultural and artistic attitudes and uses,” the actual history of the lot (how it formed, developed, and evolved), and “lots of excellence,” paradigm-changing examples that demonstrate how ecologically-sustainable and flexible a parking lot can be if it’s well-designed. Still, these unexciting spaces aren’t “no-places;” they are actually imbued with social, cultural values, no matter if the primary value is “mediocrity.” The idea that a parking lot could win design awards, as Peter Walker, FASLA, predicted in a planning magazine in the early 90s, just hasn’t taken off. Only one parking lot by Michael Van Valkenburgh Associates for the Herman Miller furniture and manufacturing plant in Georgia has won an ASLA design award since 1990. Parking lots reflect a culture that doesn’t take one its central public spaces seriously, yet there’s something still there and they do serve a crucial function. Back in 705 BC, Assyrian King Sennacherib posted signs on his highway to ensure it was cleared of parked chariots. The signs read: “Royal Road — let no man decrease it.” Whereas nowadays, you’d just get a ticket, then an improperly parked chariot could result in death by beheading. Later, the Romans actually implemented parking laws. Julius Caesar instituted rules preventing chariots from entering busy commercial zones during peak hours to limit congestion. Two millennia later, as cars, the “horseless chariots,” overtook horse-drawn carriages, they started to consume too much road space so needed to be stored somewhere. To “ease this ever-growing need,” municipalities and entrepreneurs started to offer off-street parking. Beginning in the 1930s, off-street parking began to appear in planning and urban zoning strategies. Guidelines were produced over the years, culminating in the Institute for Transportation Engineer’s handbooks Trip Generation and Parking Generation in the 1980s, which Ben-Joseph says are still the go-to guidelines for many transportation and community planners. The guides helps communities estimate the number of parking spaces needed for a particular development. The only problem: a simplistic use of these guides alone has resulted in masses of under-utilized parking lots. The aesthetics of a parking lot were considered important back in the 1920s to 1940s, but over the years, the design of these spaces was increasingly left up to developers. Even very progressive cities like Cambridge, Massachusetts offer over 30 pages of regulations on parking lots size and organization, but no rules about how they should look. The result was that many developers simply cut corners, creating the most basic parking lot possible. Many communities now treat these spaces as something to be mitigated as opposed to using them as opportunities to create something attractive that improves the quality of life. Much of the rest of the world has simply followed the very poor model created by the U.S. While this country still leads with the highest numbers of cars per capita (814 per 1,000), Qatar and Australia are close behind. The Netherlands has the highest density of cars per square kilometer, with 246 vehicles per kilometer, followed by Japan and Belgium. China is the biggest concern, though. It’s estimated that in 2010 China had some 60 million cars occupying parking lots. All of those parking lots are not only expensive but represent an opportunity lost. The average per-space parking lot cost is $4,000, with a lot in an above-grade structure costing $20,000 and a lot in an underground garage, $30,000-$40,000. To give us some sense of the opportunity lost, Ben-Joseph says 1,713 square miles (the estimated size of all surface parking lots in the U.S. put together) could instead be used for spaces that generate one billion KWH of solar power. With just 50 percent of that space covered with trees, this space could handle 2 billion cubic meters of stormwater runoff, generate 822,264 tons of oxygen, and remove 1.2 million tons of carbon dioxide annually. Still, so few communities impose even basic landscape requirements to make these places just a bit more green and permeable. He points to many well-designed examples created by landscape architects and architects but, unfortunately, they remain very rare birds. In Turin, Renzo Piano created a beautiful parking lot without parking islands and curbs, just rows of trees in dense grids inter-mingled among the spaces. Other high-performing parking lots incorporate solar panels or wind turbines, add new trees or even preserve old ones, and incorporate bioswales and permeable pavement. One parking lot in Duck, North Carolina, is even designed to serve as a detention pond during minor flooding. Ben-Joseph says a well-designed parking lot can accomodate a changing environment. To make this happen, more communities need to redevelop their parking regulations so that more creative landscape design is allowed, even required, and these spaces can become more flexible. In the future, he wonders whether parking lots could even become regenerative. Imagine phytoremediation used to turn a brownfield into a living, restorative parking space. Beyond the environmental benefits, more flexible parking spaces help communities build social connections. Already, as Ben-Joseph notes, in parking lots, children learn how to ride bicycles, teenagers learn how to drive cars, and high school students hang out after school “where the drama of youth plays out.” In many communities, farmer’s markets and flea markets take over lots on weekends. In Manhattan’s Lower East Side, there’s Shakespeare in a Parking Lot. Outside of stadiums, there are tailgaiting parties. In Wal-Mart lots, you can find RVs “boon-docking.” In a number of cities, festivals of food trucks turn a sad parking lot into a space for food, beer, and bands. What’s important is that community leaders and planners actually enable these activities and remake regulations so that parking areas can provide multiple social functions. Parking lots can also become sites for activism. One landscape architect, John Bela, ASLA, created REBAR and launched their annual Park(ing) Day, which has become a global movement. In 2009, some 700 parking spaces were designed as mini-parks in 21 countries and 140 cities. Some have even been made permanent in San Francisco, Vancouver, and other cities. These spaces can also become sites for art. Martha Schwartz, FASLA, created a funky parking lot for an amusement park, while artist Toshihiro Katayama and landscape architecture firm Halvorson Design created a stunning shared space for cars and pedestrians in Boston. Ben-Joseph seems to love the parking lot for the Dia art center. For him, it may be a work of art in itself. Excellent topic and way over-due. Less is More. A concerted effort by designers, regulators and those who write development proformas will be required to change the status quo. Still, it’s overdue. So glad this problem is being picked up and conversed upon beyond academia! How did we become so blinkered to such a pervasive land use?? We have seen some major changes in the design and development of parking lots over decades. Thanks for sharing such an informative post. Also safety is lacking in most parking lots with falls/trips over parking blocks, curbs and of course poor design overall.